I don't know what your dream is all about but I know most dreams follow the same telepathic path, and so we share that experience in common as human beings. Why do some dreams seem to manifest and some others, don't? Is it the level of commitment we put into the pursuit of a dream that truly makes it worth it or we are just on a merry go round, confused? Do you ever wonder why it hurts when you are looking back and all you feel is disgust from actions from your past? Why don't we understand that every dream is just a means to an end? Realistically, our dream capacity is at it's strongest when nothing seems to work. The dream is not some giant ball from outer space, zapping you to another world nor neither is it something that all of a sudden changes your fortune, without putting work in. That is a lazy Man's dream. Consequently, your dream should be to build from scratch. Sometimes, it feels like the most stupid decision, but by holding on, you control the process and partake of the experience. That to me is the dream and whether or not you manifest is not your call to make nor should the blame be solely on you or on the spirits of our ancestors hovering around the earth since thine kingdom come. No! It's none of those. The dream is not until it manifests in a thousand or million folds. The dream is in the process of becoming. At the end, to gain clarity, you would have to come to terms with the reality of your existence and look not at the immediate gratification but undergo the pain and I can bet my wits that if you FOCUS on whatever it is you are passionate about then truly you are living the dream, living your dream. In bits and pieces, everything will start falling in place and lines begin to fall in pleasant places for you. And even when it delays or doesn't sparkle like you wished, you can immerse yourself in the wealth of knowledge and experience you have gained. The lives you have touched. The risks you have taken and the places your heart long to be, and hopefully that is enough inspiration to see you through. Great post. The journey is key. Enjoy the process. Someone once said, paraphrasing now, "the joy in having a big dream or setting a big goal lies not in achieving it but in the prospect of the kind of person you would have to become to achieve that goal." 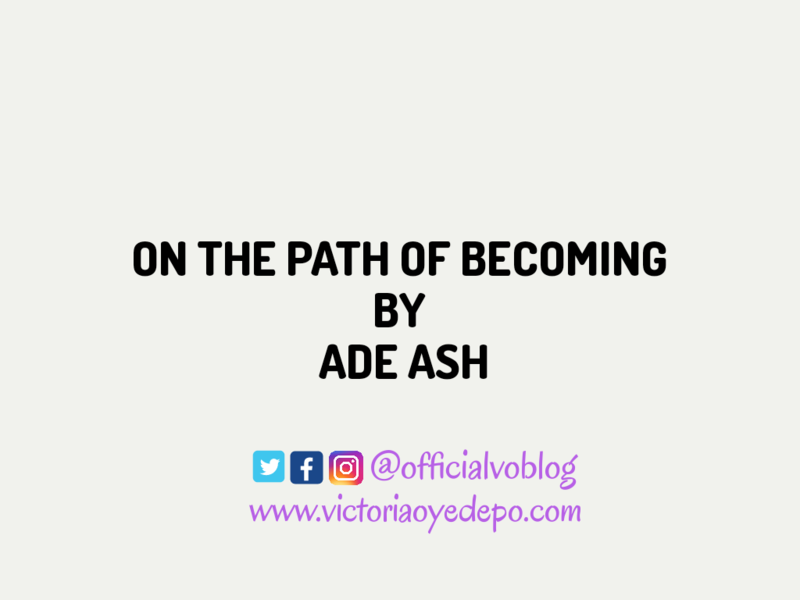 Like Ade Ash said, "The dream is in the process of becoming," so revel in your becoming and enjoy the process. Thanks Ade Ash et Victoria.